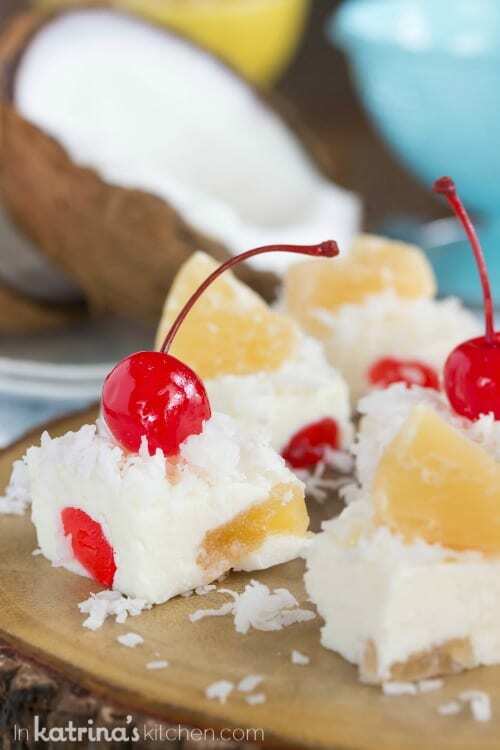 A sweet taste of the tropics- piña colada fudge recipe! This Piña Colada Fudge recipe couldn’t be easier. My extended family has a luau every summer and you can bet I’m bringing this dessert. I think I’m going to have to triple the batch because it is just so good. Everyone will be wanting a sample! 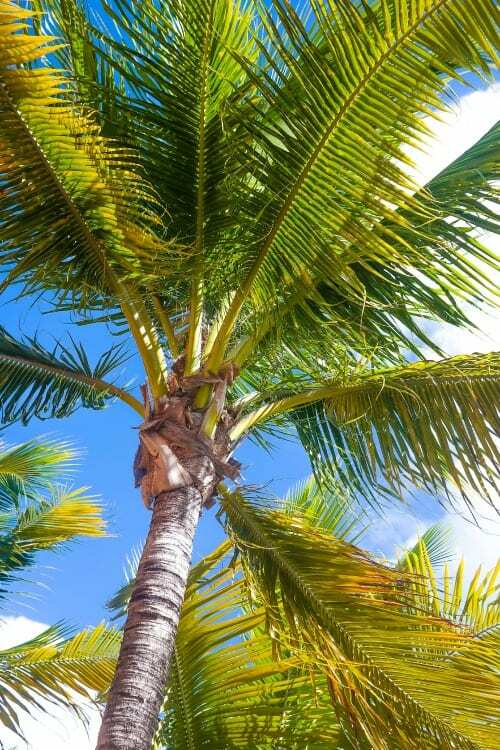 Confession- before I went to an actual tropical island I had never seen fresh coconut. I had no idea it was so lush and green. 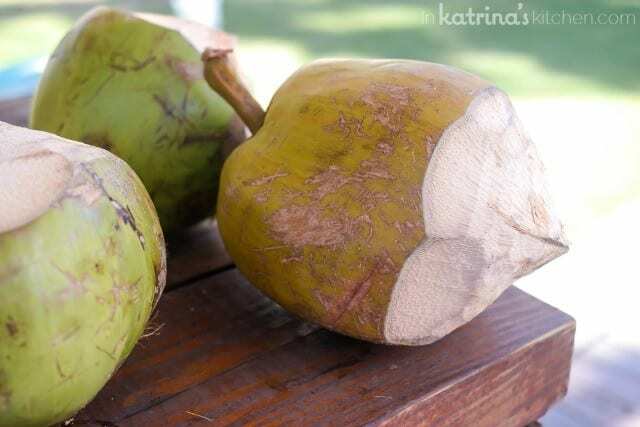 I always buy the matured brown coconut in the grocery store. 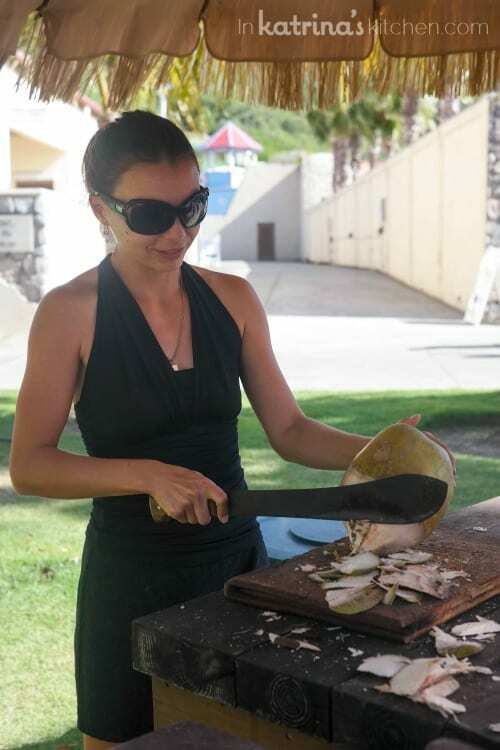 But when a woman chops down a coconut from a tree then uses a machete to slice off the top and mix a drink for you? Don’t ask questions. Just thank the heavens for your good fortune. But seriously though. Take. Me. Back. This private (pink!) 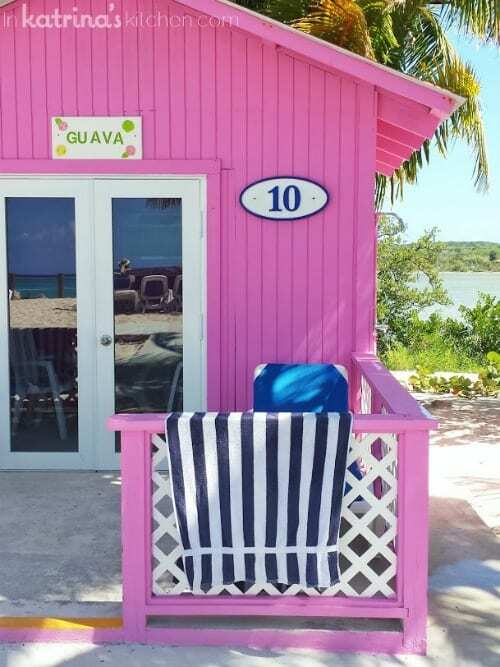 cabana was my home for the day on the Princess Cays Island. I alternated virgin piña coladas and mojitos that day. A sweet taste of the tropics- piña colada fudge! Spray a 9x9 pan with cooking spray and/or line with parchment paper. Melt white chocolate chips in a microwave safe bowl. Stir the white chocolate, frosting, coconut, pineapple, and cherries into the melted chocolate until smooth. Spread into prepared pan. 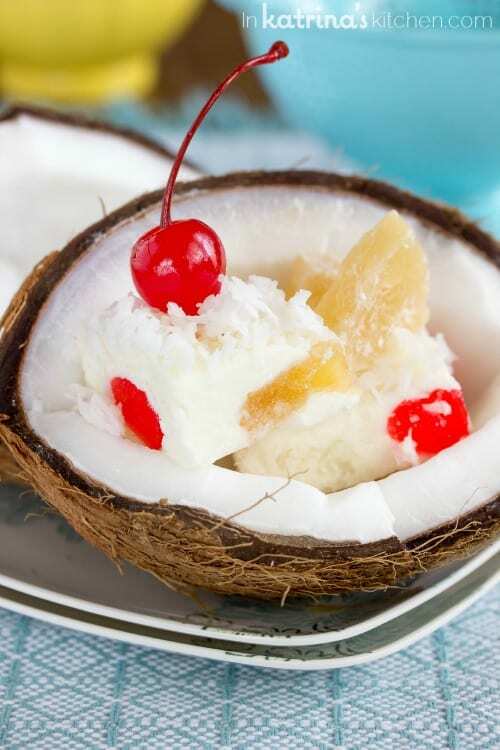 Top with additional coconut if desired. Chill for 1 hour. Cut and serve. Garnish fudge slices with more candied cherries and pineapple slices if desired. It may be known that I am a fan of Pina Coladas… but oh my gosh – I’m really a fan of this fudge! What a great idea! Okay, I love pina coladas… and now I’m loving pina colada fudge! This is such a great recipe! I adore pina coladas…and now in fudge form. Yes, I’m going to need to have this fudge in my life!! It is gorgeous! I loved following all your cruise pics on instagram…so much fun on that ship!!!! Yes!! A perfect summer fudge! I usually only make it around Christmas and Valentines but now I have the perfect excuse to make it whenever I feel like it. Can’t wait to try it! 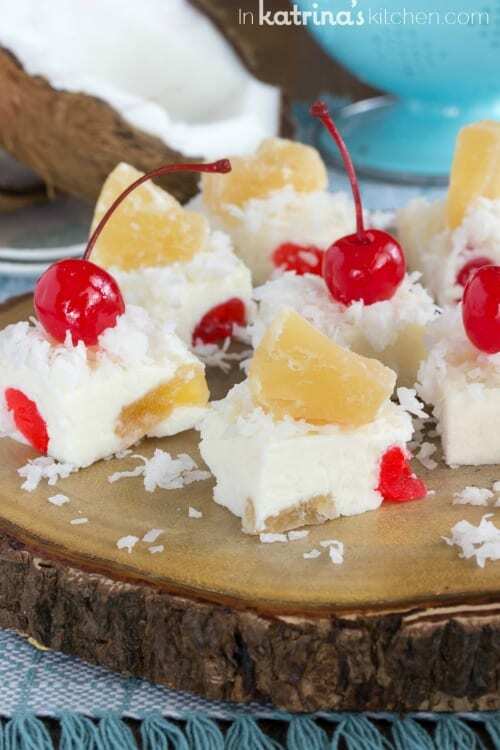 Would have never thought of pina colada fudge, but looks like you nailed it. Also, I love that you were able to experience a real coconut for the first time! 🙂 Hope you are doing well. I wish I had some real coconut on the island!! I must’ve missed it! Coconut fudge sounds so awesome!! Pina colada away! It’s the season for bright, tropical flavors–I’m all in! This recipe looks amazing. Pinned. What do you do with the can of frosting? How fun that your family does a luau every summer! I want to sit in front of that cabana, with a piece (or five) of this fudge on hand. Seriously – best fudge ever. And I totally missed out on the fresh coconut. Guess I need to go back asap now!! What an adorable, summery fudge recipe. Clearly, I need fudge and a Princess Cruise in my life! I need to be whisked away to the tropics!!! But until that happens, a piece or two of your luscious fudge will have to do! Just looking at this fudge makes me want to go on a Princess Cruise! It’s looks so tropical and tasty…yum! Pina colada fudge? This is pure genius! This is the greatest looking fudge ever! So pretty. And all those wonderful flavors from your trip! You’re family has a luau every summer? I want an invite and to be able to try this fudge! Seems simple and am going to give it a try today; will come back to say how it goes. Does anyone know how long it will keep? Would love to give to friends but am not seeing them for another 2 weeks.